Nose: Flowers and dry exotic fruits such as mango, sweet spices such as cinnamon and vanilla, and peppery notes towards the end. Palate: Coffee and chocolate, cinnamon and cloves. 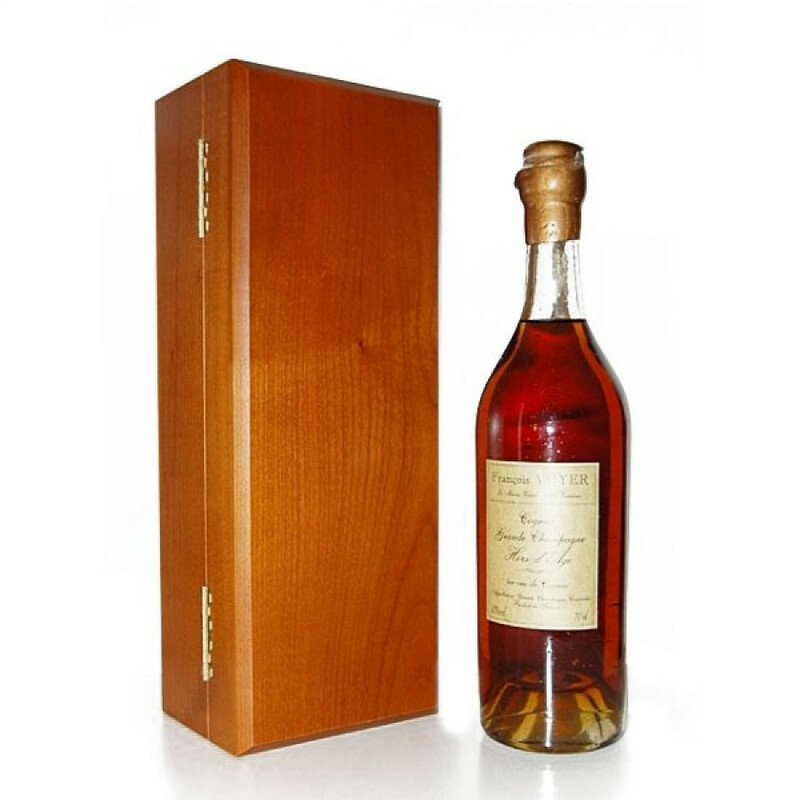 The Francois Voyer Hors d’Age is a true commitment to traditional Cognac production, dating back to the year of 1870. This is a thoroughbred Grande Champagne Cognac with a careful assembly of eaux-de-vie descending from the Premier Cru in the region. Not only is this of unique quality, but some of the eaux-de-vie from this blend have been aged for up to 60 years, and no less than 40, making it a veritable Hors d’Age classification. For this reason perhaps, it has become a favorite among culinary experts in France. Selected by Alain Ducasse, who has 19 Michelin Stars to his name, this is a house Cognac at ‘Le Jules Verne’ restaurant on the iconic first floor platform of the Eiffel Tower. As a premium Grande Champagne blend should demonstrate, the Voyer Hors d’Age is a true harmony of incredibly synthesized flavors and aromas. It is the apogee of luxury and elegance. The François Voyer Cognac maison dates back to the 19th century, where the philosophy behind their technique is one of double distillation what they themselves produced. Such artisanal craftsmanship is practised in each and every one of their blends, which range in ages, and are at least 20 years old. When you indulge in this precious blend, take a moment to remember the time taken to create this Cognac, and just how many people were involved throughout the different stages of production and maturation across the decades. Ponder over each note, and appreciate this exquisite Hors d’Age Cognac; breathing in and tasting its depth and nobility. Whatever you do, never add anything to this Cognac. No ice, no water, it must be experienced neat. Enjoy it at room temperature, exactly as you found it. Let the complex aromas inspire your senses. This 0,7 liter bottle is made in an old-fashioned Cognac bottle style, with delicate air bubbles inside the glass which allow the Cognac to shimmer incandescently. The top and neck of the bottle are sealed with golden wax, and it is presented in a beautifully crafted wooden box. Needless to say, this incredible bottle is extremely limited in quantity, and really something for a special occasion. Join the team at Cognac Expert and take a virtual look at the Francois Voyer artisanal Cognac house when we went to see it for ourselves. We also visited the Prowein 2014 convention and were presented with the Hors d’Age by Pierre Vaudon, the current Cellar Master at the maison.